A rare screening of The Man who fell to Earth comes to Liverpool, Getintothis’ Del Pike reflects on Bowie’s spaceman period plus news of a special auction. A year has passed since our beloved David Bowie went and left us, so expect tribute events across the city, it’s both inevitable and essential. Some events will be worthier than others and we feel that this one is a must for Bowie fans and movie buffs alike. Our friends at FACT are hosting a night that offers something slightly different to the usual hero worshipping by posing a simple but perplexing question; What does space sound like? Record producer Steve Levine, the producer responsible for bringing out the best from the likes of The Clash, The Beach Boys, The Creatures, Culture Club and America and who is no stranger to Liverpool acts including China Crisis, Space and Natalie McCool, will be hosting the event. Ground Control: Soundtrack to Space promises to explore the archetypal sound of space taking in the work of early Bowie and Floyd to more modern artists like Radiohead. FACT executive director Jo Wright will join Levine in this exploration with a focus on Bowie’s Space Oddity and will gaze further into ideas of how the silence of space has been translated into sound by Bowie and other experimental musicians. Bowie has linked space with his music throughout his career, marking his move from the chirpy London boy pop of his early years to the strung out Major Tom persona of Space Oddity in 1969. Returning to the theme in Ashes to Ashes, his 1980 hit single, he would keep on making those references through 1995’s Hallo Spaceboy and in his swansong single Lazarus last year. Even as Ziggy Stardust, Bowie felt like something from another planet, he very rarely felt like the boy next door. As an actor Bowie didn’t always hit the mark, but working alongside Nic Roeg in his 1976 sci fi psych-out The Man who fell to Earth, Bowie perhaps found the character he was born to play in the alien Thomas Jerome Newton. FACT will follow Levine’s presentation with a screening of a beautiful 4K restoration of this cult classic, a print that surely will benefit from a big screen presentation. The film harks back to a time when it was ok to be experimental and not have to bow down to the whims of the studio, and even today it is a difficult yet rewarding watch. 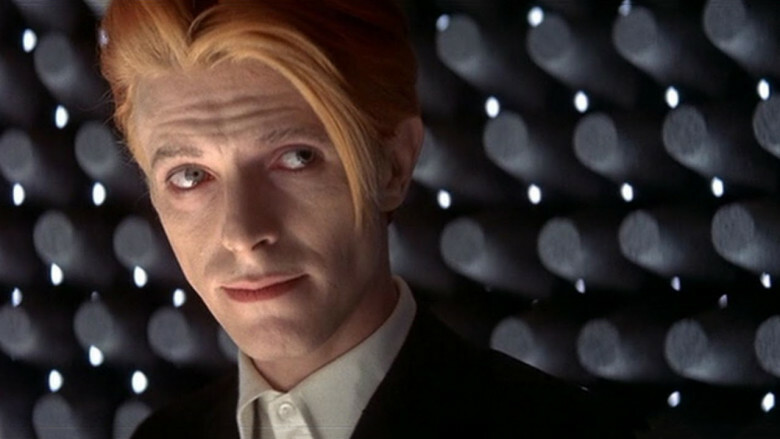 Whilst the film does not contain any Bowie music (music was composed for the soundtrack but rejected by Roeg – seriously), his presence in the film is vital to the overall effect. Whether appearing as the enigmatic pale dude in the black overcoat or his more predictable bald head and cat eyes as a traditional movie alien, Bowie sets the screen alight and works in perfect harmony with his co-star Candy Clark. Bowie used an image of himself as Newton for the cover art of Station to Station that year and on the cover of Low which was released the following January of 1977. This on-screen persona was clearly popular with Bowie as Newton re-emerged as the lead character in Bowie’s Lazarus Broadway production, a companion piece to his final Blackstar album. The Man who fell to Earth is part of a run of films by Nicolas Roeg that surely places him as one of Britain’s most important directors of that decade. Alongside Performance, Walkabout and Don’t Look Now, all blisteringly excellent films, Roeg proved himself to be a true visionary auteur who never quite recaptured his genius in later films like the dreadful castaway and Roald Dahl’s The Witches. Roeg’s golden period was paid homage to in Big Audio Dynamite’s killer E=MC2 single in 1985 and the films continue to astound modern audiences to this day. Ground Control: Soundtrack to Space is being shown as part of FACT’s ongoing exhibition No such thing as Gravity which runs until Feb 5. The event will take place at FACT on Jan 18 with Steve Levine’s presentation and a Q and A kicking off at 18.30 and The Man who fell to Earth will be screened at 19.50. The whole evening is included in the ticket price of £15.00. More Bowie related news, prolific Bowie collaborator Tony Visconti (did someone say genius? ), has created a unique Bowie themed box to go for auction on eBay. Proceeds will go to ParcelHero’s Great Ormond Street appeal and the auction has already started. Hand decorated by Visconti, this tempting box features sheet music from Bowie’s song “Can You Hear Me” and the top of the box has been signed by Visconti. The box also includes various guitar picks, a capo and Bowie-themed badges. The hospital aim to raise £1,500 from the sale of this unique artefact to help buy a portable heart monitor. Other artists will be making boxes too for further auctions including cult jazz pianist Louise Vause, and the gothic Icelandic painter and musician Jón Sæmundur Auðarson of Dead.is. These are due to be auctioned soon.